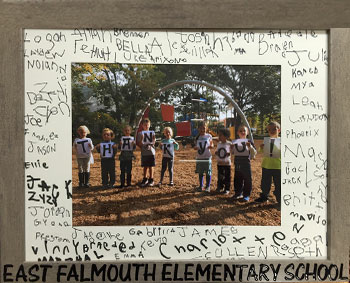 In 2014, the older children (grades 1-4) at East Falmouth Elementary School received a new playground, purchased with $103,265 raised by the Parent Teachers Organization and installed by the Parks Department as an in-kind contribution. The PTO had formed a special committee in October 2011 to conduct the fundraising effort for the rehabilitation in two phases of the school’s two deteriorating playgrounds. The playgrounds are the only recreational play areas in the Village of East Falmouth. The equipment in the first playground to be rehabilitated was twenty-eight years old, rotting and falling apart. 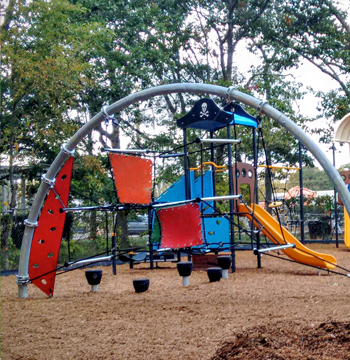 Now it is a state-of-the art playground of modern, more durable materials used not only by children during the school day but by East Falmouth families in the evenings and on weekends year round. Donors to the Phase I playground included, as well as school families and friends, the Woods Hole Foundation, the Falmouth Fund, the Falmouth Masons, the Falmouth Track Club and the Falmouth Education Fund. Additional donors preferred not to be listed. In 2013, the PTO asked for and received from the CPFund a grant of $64,406 for the rehabilitation of the second playground, for the younger children (preschool and kindergarten), also to be installed by the Parks Department. The existing playground was twenty-three years old and also rotting. With the completion of the second playground, the school could ensure that all its students had safe, physically appropriate and accessible equipment to utilize for play and exercise. The second playground was completed in 2015. Both playgrounds were installed to be ADA-compliant, accessible for children, teachers, and family members with disabilities. The new equipment also meets the needs of the school’s occupational therapist.